What we love about the all-inclusive Moon Palace Golf & Spa Resort, located outside the main city of Cancun along the coast of Quintana Roo, is its ability to meet our vacation needs no matter what they are or how they change. If we want urban energy, there’s a big disco and the glass-enclosed Sky Bar plus dozens of other bars, several theatres and 15 restaurants ranging from international buffets to Japanese and Caribbean. If we want to work out, there’s watersports and yoga, spin classes and a bike trail. For relaxation, there’s a video arcade and a spa, golf and tennis and hundreds of chaise lounges by the pool. If we want beach, there’s a quarter-mile of powdery white sand along the Caribbean, with a guarded turtle nest corral at the north end. Because there are more than 2,300 places to sleep — plus a convention center — in this sprawling landcaped complex, it’s big enough to deliver several vacation styles. DJs flank some pools while classical music or the silence of frogs in daylight plays at others. There are elegant rooms in marble and beige, very Mexican rooms in dark wood and wrought iron, and fun rooms with gold lamé headboards. With free shuttles to the Beach Palace Resort in nearby Cancun city, you can choose a day of glitzy shopping at the Zona Hotelera malls, then swim with dolphins that same afternoon. Underpinning all resort operations is an authentic Mexican warmth and personal attention that makes every guest feel welcomed. This huge oceanfront fun factory is a complex of three resorts with complementary facilities and their own personalities. The Sunrise wing — totally renovated in 2012 and where most families go — has many pools, an awesome teen lounge, adult nightlife and an all-night deli. A small convention center addition is expected to open in late 2014. The calmer Nizuc wing in the middle of the three, has just been redone. In keeping with this resort’s move towards a more stark and contemporary design, Nizuc now boasts big modern works of art in the public spaces, high ceilings and dramatic design accessories. 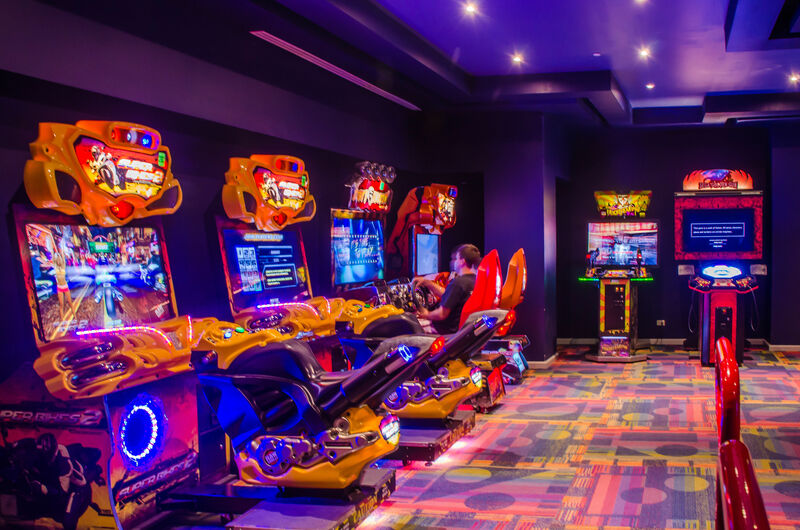 In addition to adding an Irish pub to the few finer restaurants, Nizuc has installed a family-friendly minigolf course, kids playroom with video game arcade, and two playgrounds. We like having the beachfront theatre and one of the two gyms there — it’s easier to take Pilates, zumba and other classes or watch the night’s show. 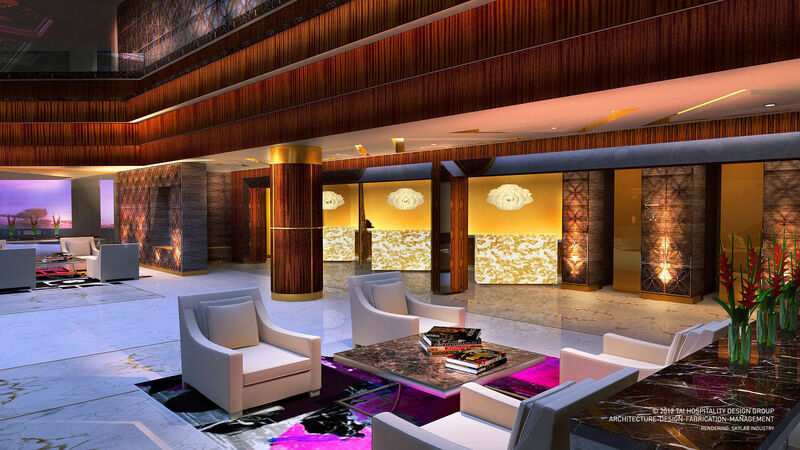 The elegant Moon Grand — the newest wing — has more marble, more concierge staff, a gourmet Los Tacos cafe and VIP pools, and it will grow to nearly double its size by next year. Each wing has a diverse crowd; I met grandparents here to host a family reunion, young couples, friends celebrating a destination wedding, large Chinese families, small British families, and many single guys enjoying a week of diving, watersports and beer. 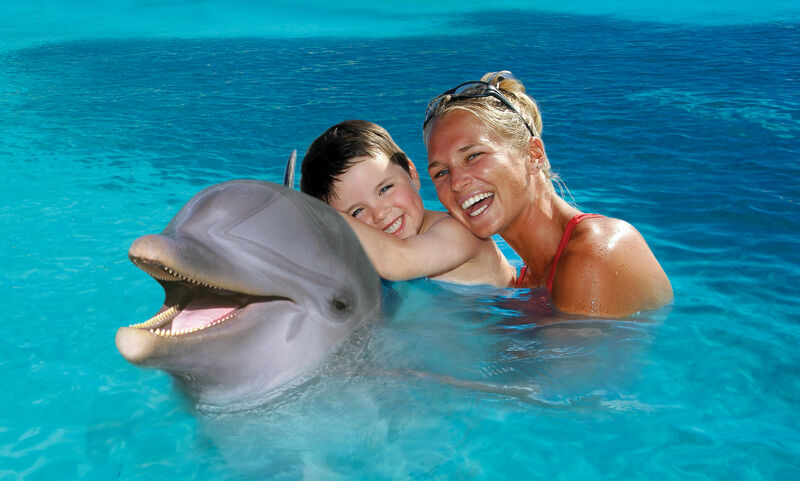 Moon Palace is so large, it boasts family activities most other resorts don’t have, like its own Dolphinarium where the whole family can enjoy dolphin interactions run by Dolphin Discovery. Although this would normally be a $129 premium activity for (otherwise) all-inclusive guests, many families use the resort credit they earn for stays of five nights of longer to pay for this, and other non-inclusive activities like the spa and golf. 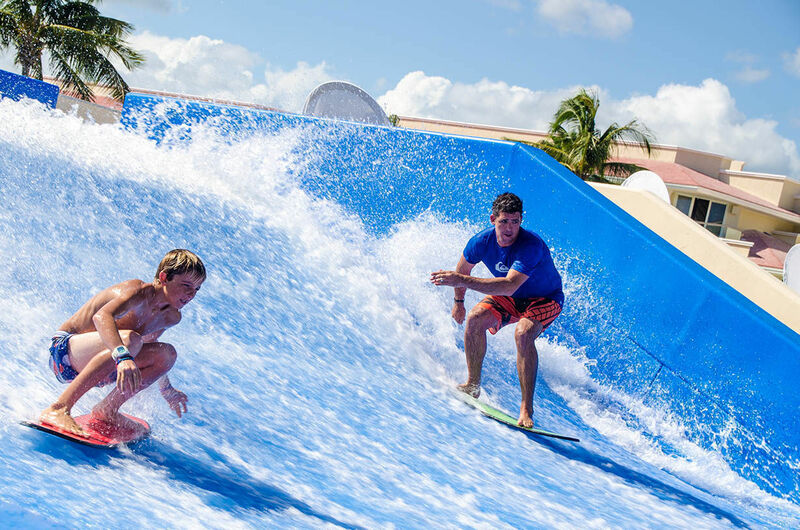 Kids who are tall enough can try the Flowrider wave simulator that is divided into lanes for body boarding (manned by a lifeguard), and a frenzied standup section that attracts surfers and skateboarders. Outside the resort, families can participate in zipline tours, go to a waterpark, or take guided tours to local Mayan ruins. On site, the large, brightly painted and clean Nizuc Kids Club (open 10am to 10pm) welcomes kids ages 4-12 for counselor-led activities. These range from sand castle building to arts n’ crafts, to treasure hunts on the Pirate-themed day, iguana feeding on the Green themed day and even popsicle-making on the Food-themed day. The Sunrise wing’s Sunrise Kids Club with similar programming was totally redone in summer 2013 to include large outdoor and indoor playgrounds, a girl’s branch of the beauty salon, cooking and dollhouse facilities, dressup areas, a theater and more. Guests staying in any wing can use any of the clubs. The one teens club, Wired, is a glittery neon-striped cave of video game stations, computers, table games and a snack bar manned by young and friendly staff. Designed as an exclusive teens hangout, we can understand why it was packed with younger kids and dads at our visit. If the planned activities aren’t enough, families can create their own scavenger hunt, following signs along the walkway warning you not to feed the crocodiles in the mangrove habitat and not to bother the many large iguana who call it home. This resort is big, but it’s designed to be very accessible. At the Moon Grand, room blocks and common facilities are built within a mangrove habitat frequented by huge iguanas and shy crocodiles (no, I did not seen one), with concrete paths winding around. Between the Grand and the other two wings is a free shuttle bus system, and the staff uses electric golf carts to deliver luggage and transport guests locally. As you work your way along the grounds, you’ll see several zero-entry pools and ramps running parallel to many of the stairs that lead up and down around them. Handicap accessible rooms are scattered throughout, with easy reach balconies, large doorways and furniture at the right height for those who are wheelchair bound. One of my favorite strolls was the paved path along the seafront promenade — breezy and mysterious after sunset with the lights of Cancun glittering in the distance — that connects all three resorts. As you can see from the video, the tastefully neutral guest rooms at the Moon Grand are unusually large and have their own Jacuzzi, a Palace Resorts signature. The Swim-Up Suites at the Nizuc have small balconies that overhang a private pool. Sunrise has its variety of room styles and sizes which have been renovated with more mirrors and gold. Family Connect Rooms are two standard rooms with a connecting door and special amenities, such as mini-bathrobes and toys, for guests with young children. Special guest touches include baskets of loaner books and sunblock at each of the towel sheds, and wait staff that circle the pools asking if you’d like a menu or drink. The restaurants we sampled were quite good — my authentic breakfast tacos were delicious and the entertaining teppanyaki chef who juggled knives at Momo made eating out a big adventure. At any restaurant, if you want the waiters to packge your meal to go, or you prefer room service, the choice is yours. Munchers and snackers are accommodated in high style. In addition to a coffeemaker, basket of packaged chips and cookies, and fully stocked minibar with juice, soft drinks and premium alcohol, small plates of artisanal chocolate are delivered to your room. At the Sunrise wing, there’s a full cafe in the lobby bar, where you can get a fresh panini to eat inside, take to the pool, or eat in your own room. Chocolate and dessert addicts will love the ice cream shop scooping the resort’s delicious homemade, extra creamy ice cream into cones and cups; and the bakery serving petit fours, artisanal chocolates and other fine bites — both open 24/7. The night crowd and adults and kids 18+ can take advantage of the stylish Noir Disco, open some nights early for a teen-only event. There are a few large theatre venues with evening shows, including big name bands and guest karaoke. With the lobby lounge and sleek Sky Bar for afternoon and evening, Sunrise has the most nightlife. Intra-resort shuttles run 24 hours to accommodate those who want to party. Moon Palace is not only convenient to the Mayan ruins and ecological parks of Riviera Maya; it’s also very easy to get to because it’s only 10 minutes from the airport. The size, scale and variety of activities and dining make it a good choice for family reunions and multigenerational trips, where everyone wants family together time at the pool or beach, yet time alone to nap, shop or learn a new sport. Rates vary widely at different times of the year and for different room classes, but with the many value-adds given as package offers, most families will be able to find a time that works. Palace Resorts runs an annual summer family vacation offer in which children under 12 can stay free. Not only are prices at their summertime low (rates from $560 per night for family of four), but with a five-night’s stay, guests receive a $1500 credit towards extra activities. At Moon Palace, there are also special rates for single travelers — very unusual at an all-inclusive — starting from $440 per night. The two-room Family Connect Suites for adults with kids ages 4-17 start at $710 and Luxury Connection suites are $1020 per night. Contact your travel agent or Palace Resorts directly for current rates and more information. This sounds like a great resort for my all-inlusive loving teen children, who have a " bigger is better" attitude. I love that it is so close to the Cancun Airport, so you can get right to the fun as soon as you land.